This is the older version of this MFU. It's huge and weighs about 6 lbs. I have removed the base, that attaches it to a boom stand, and replaced it with a wood base to attach to my set-up. Just have to figure out how to mount the specimen on the large moveable top piece that is permanently fixed to the base. A newer version currently available. Seems that they have improved the focus dials. "Please avoid posting images in someone else's topic, unless that person has clearly indicated that followup images are welcome." 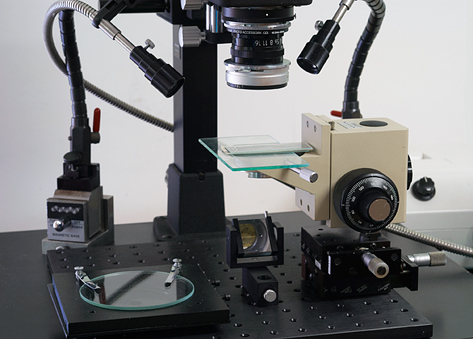 I welcome other images of focus blocks and/or images showing how they are used. I could use something like that (vertically oriented). I am using a micrometer stage at present, but that provides extremely fine movement - plus the coarse movement to get started. Where are focus blocks found? Click on "HERE" in my original post, and/or check on e-bay. The statement of where to find them and a "here" button should have tipped me off. This should be a great piece for your purposes. The black top plate looks as though it will come off, 4 screws. The moving piece is attached to a conveyor belt in a window; you can just see the front end of this window. I don't think I will attempt any disassembly. Tried to fix a very smooth running fan once, and lost the 2 ball bearings that the shaft impinged upon. On another note. Finally got hold of a 50/2.8 El-Nikkor (the older one, without the N). Has a female thread on the front that appears to be 40mm diam. I believe this lens has to mounted in reverse on my bellows (Nikon PB-6). Do you know if the diameter is 40mm or perhaps 39 or 41 mm? 39 mm male threading. You can get 39mm to f-mount adapters on Ebay if you want to mount one normally. Reversed you will need a 40.5 mm - 52 mm step-up ring. Thanks, exactly what I need to know. I haven't gotten the 39 --> fmount adapter in the mail yet (mailed from china ), but I hope it will work fine. Should get it soon. Another option is to use a Nikon BR2A. It has a Nikon bayonet fitting on one side which attaches to Nikon bellows or extension rings and a 52mm male thread on the other that will atttach to the filter thread of a reversed Micro Nikkor, for eg; or the female 52mm thread on a 40.5mm - 52mm step-up ring. Google Image Search results for Nikon BR2A. To enclose and protect the end of a reversed Nikon lense, EL-Nikkor or Micro Nikkor I use a Nikon BR3. It allows you to attach filters... To use the BR3 with a reversed EL-Nikkor you will still need the 39mm to Nikon Mount adapter. Got the M39 --> F-mount adapter today. Works fine for mounting an enlarger lens normally (providing it has 39 mm threads which is typical for all but the longest focal lengths). Got it from a chinese seller on Ebay $14.95 free shipping (took about 2 weeks). 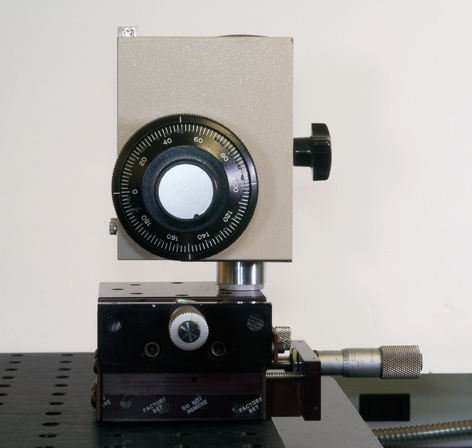 Have you considered the advantages of using this particular focus block in a vertical configeration? It would require using the 24.5mm post mount attachment or the four bolt holes on the back side for mounting to a suitable base. The nosepiece mounting dovetail assembly could be utilised to support an appropriate stage. I am working on a similar arrangement myself using an Olympus BHMJ focus block in a vertical configeration. Getting back to the horizontal approach...How much useable 'thread' is there in the highlighted areas of the image below? It is hard to tell from the angle of the image; but there appears to be a thread in there to which a horizontal plate serving as a stage could be attached?? 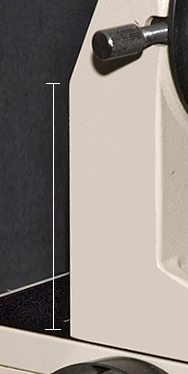 There also appears to be a good area, indicated in the image below, for attaching a right-angle bracket to the "moveable piece", such as the Thorlabs AP90 or a Newport 360-90, just as an example. 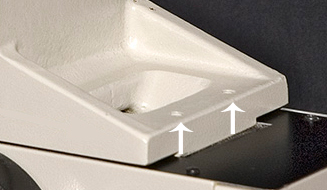 A suitable stage or platform could then be attached to the right-angle bracket. Craig, thanks for your interest. the distance between the two outside tips is exactly 0.40mm. Problem now is the halos that HF puts around parts of specimens. Those 2 front holes are 1/8" diameter and 3mm deep with an unknown thread. However the back vertical plate is 7cm high and has potential for adding a specimen holder. I certainly prefer working in a horizontal configuration but for temporary wet mounts I really need to work vertically so that the subject stays in the horizontal plane. The Pseudoscorpion was in a vertical plane; had to leave it overnight, before photographing, to allow it to slide down to the bottom of the slide and stabilize. Much better if I could photograph it flat. 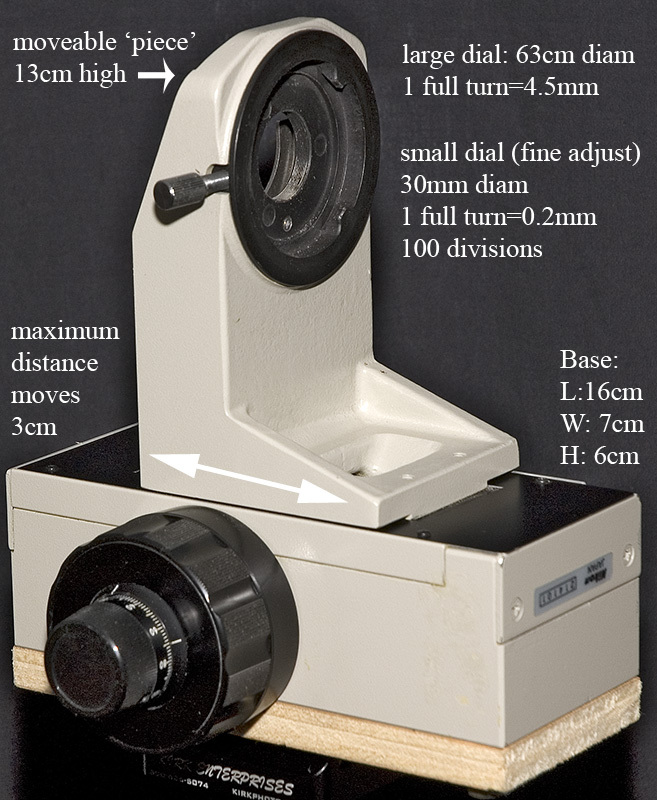 Currently I am trying to modify an enlarger stand to use the set-up in a vertical alignment. From what I have seen, the Olympus BHMJ block appears to be more adaptable than this Nikon block. Just a quick shot of the BHMJ post mounted to xy translation stages for a vertical arrangement - no stage attached yet. I am still sketching a stage design. Nice setup. I presently have a vertical stage mounted on a bench plate for focusing. I recently bought a Nikon modular focus stage and will have to get that mounted to something. I am thinking about using a very large bolt and nuts to mount it onto something (not sure what to mount it to yet).